10% Off Any RV Inspection! Schedule your RV Inspection Today! Summer Travel can take a tole on your RV. Take care of any ... [More] repairs or services needed before the new travel season is here. Don't wait until the last minute to have these services completed. Call us today to schedule your RV Inspection to ensure your RV is ready to hit the road when you are! Most cars & light trucks. One coupon per visit. Not valid with other offer or special. Coupon must be presented in advance. SUNSHINE SERVICE OFFERS COMPLETE RV MECHANICAL SERVICE AND REPAIR. 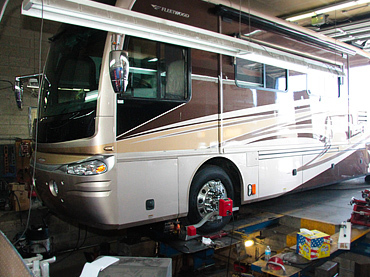 Sunshine Service specializes in anything mechanical as it relates to RV repair and service. Sunshine Service has specially some designed RV lifts, bays and pits allow us move easily and thoroughly around any size motorhome or trailer for detailed troubleshooting and accurate RV repair. For drivability issues, we offer what we call our Ride Performance Assessment service, which enables us to identify areas that can be improved up, as it relates to aftermarket products that can dramatically improve your vehicles handling. Sunshine Service Brake & Alignment is conveniently located on 850 S. Rock in Sparks, across from Baldini’s. Just off I-80. Call now for prompt service: (775) 358-5486. Expertise: Your RV is repaired by some of the most knowledgeable and skilled motorhome mechanics in Northern Nevada. We’re known for identifying the real cause of your RV problem and fixing it right the first time. Access: Our full length pits and specialized equipment let us efficiently work on large vehicles from RVs to fire trucks. This gives us easy and clear access to every part of your RV for thorough troubleshooting and reliable RV repair. Convenience: From struts to engines, we’re experienced and equipped to service every part of your RV that makes it run. 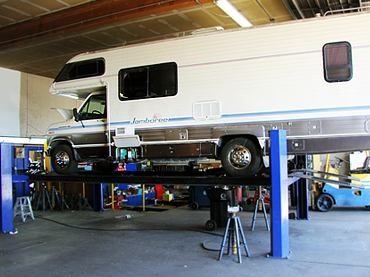 Bring in your RV for routine maintenance like tire balancing and oil changes. To specialized work including RV electrical issues and RV engine repair. If your car or truck’s making a funny noise, or it’s not behaving like it used to, bring it in for a fast and accurate diagnosis. We’ll give you our best suggestions on how to get it fixed based on your time and budget. Sunshine Service Brake & Alignmnet has years of car repair expertise and can help you get back on the road right away. At Sunshine Service we fix those mysterious check engine lights that suddenly come on. Modern cars and trucks are run by a network of sensors and switches that convert and monitor engine operating conditions into electrical signals. We’ll find out if the check engine light is a real problem, or just a sensor that needs resetting. RV road test – During your RV Road Performance Assessment, you ride with a certified technician as we drive over various road surfaces and driving conditions including potholes, narrow roads, and sharp turns. In this step, we analyze your RV’s steering system and your RV’s suspension system. 50-point RV inspection – A properly tuned RV suspension and steering system enables your motorhome to adapt to various conditions and improves your driving control. RV parts inspected include: tire wear, steering gear, tie rods, bushings, calipers, king pins, ball joints, disc brake rotors and pads, shock absorbers and more. RV handling report – Based on the assessment results, our skilled technician will share the results and suggest recommendations to improve your RV’s handling safety, reduce vibration, and stress to you, your passengers, and your motorhome. RV OWNERS DRIVE THROUGH RENO JUST TO WORK WITH US! You don’t have to live in the Reno/Sparks area to trust us. 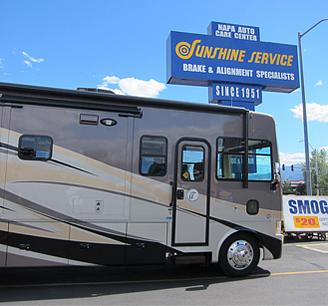 Sunshine Service Brake & Alignment maintains such high quality RV service and RV repair, motorhome and trailer owners from other states come to us for their routine RV maintenance and to accurately troubleshoot puzzling RV problems. Several times, RV owners adjust their route to pass through Reno, just so we can service or repair their RV! We take this responsibility very seriously. That’s why for 3 generations and counting, RV/motorhome owners know we’re a crucial part of helping them arrive safely at their destination and back home. WHETHER YOU LIVE IN NORTHERN NEVADA OR YOU’RE PASSING THROUGH RENO/SPARKS, CALL US TODAY FOR RELIABLE RV REPAIR AND SERVICING: (775) 358-5486. For 3 generations, we expertly service: RVs, 5th wheels (fifth wheels), motorhomes, 3-axle semi tucks, camper trailers, fire trucks, school busses and other large vehicles.